See our prices and save today! How Does RTA Save You Money? 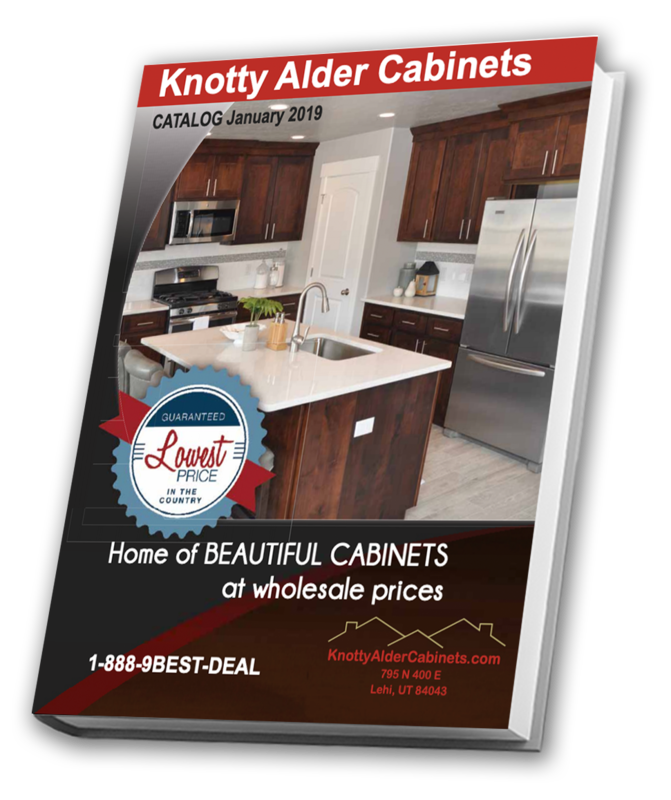 Welcome to Knotty Alder Cabinets! We are a kitchen and bathroom Factory Direct Distributor offering the widest online selection of top-quality Knotty Alder Cabinets. We’ve been in the business for well over 20 years and continue finding ways to offer more cabinetry solutions to all clients. We offer up to 50% off standard retail prices and great shipping rates to locations all over the country. We offer ready to assemble (RTA) cabinets, which mean that you can save money on labor and building costs. We strive to make it so that anyone can put together our cabinets; if you ever get stuck, we love to help our customers through problems over the phone. Learn more about what RTA Cabinets so great! All the cabinets we ship are carefully and professionally packaged in our distribution center. Buying directly from us means you get wholesale prices for high quality products. Click the images below to enlarge. Knotty Alder is a beautiful premium hardwood favored by those in the design and construction industry for its natural beauty and character. Our cabinet panels are top of the line and feature knots in the wood grain that accent the stain and finish to enhance the look of your space. Our glazed and dark glazed products also have a touch of distressing for added character. Visit our product sizes and specifications page to find the different dimensions of all the cabinets we offer. The same page will also help you get the exact fit and specifications for your kitchen or bathroom. Starting on a remodeling project is difficult if you do not have the right tools to get you started. We offer free cabinet color samples that can help you decide which color fits your design, space, style, and preference. Request a sample today to get started on putting together your dream kitchen! Exactly How Much Will Your Cabinets Cost? Hi Dave, You have a wonderful line of cabinets and I have enjoyed working with you. As with most large projects there are inevitably some extra pieces I needed at the last minute. The excellent customer service and fast shipping was very much appreciated. We have received many comments on the overall quality of the cabinets. The cabinets were easy to build and install to make a professional looking home. Hope to have the opportunity to work with you in the future. Thanks again. Eric H. Lake George, CO. I have just put together some of the cabinets. I’ve got to say, I am VERY impressed so far with the quality of the cabinets! The finish is just what I was expecting and wanted and the quality of the alder is excellent! Thanks so much for the fast service, reasonable prices, and great cabinets! I will send you a picture when everything is installed. I received my order last Wednesday, just one word: ‘IMPRESSIVE,’ I have been in the building trades my entire life, close to 40 years. These cabinets are the best I have ever used. You will probably be hearing from me and my friends again in the near future!!!! Thank you. Hi Lynn and Paul, The cabinets are amazing! The kitchen design really maximizes space and functionality. Everyone who see them love them! It Seemed like such a risk to buy ready to assemble cabinets online but from start to finish your company is amazing. I know I was probably your neediest client ever but you were always wonderful. I feel such a sense of accomplishment every time I look at my beautiful kitchen and I really do think of the two of you who were so patient and accommodating every time I called. We saved so much money but did not scrimp at all on quality or beauty! Thanks again! “Knotty Alder Cabinets has been a tremendous help to Habitat for Humanity. They have given us the opportunity to sell high quality cabinets to our customers at an affordable price. The quality and service is great, and we have really enjoyed working with them over the last 2 years. When we sell these wonderful knotty alder cabinets, we have confidence that our customers will be more than happy with the quality and timely manner in which they arrive. Thanks to Knotty Alder Cabinets, Habitat for Humanity has been able to provide affordable housing to more families in our area".